Many great minds have contemplated MAE WEST — — but great minds don’t think alike. Academic and author Chase Dimock has written an interesting article on Mae as a playwright. This is Part 10. • • Chase Dimock wrote: In an interview, Foucault once stated “Medical power is at the heart of the society of normalization. For Foucault, this juridico-medical complex is a form of bio-power, a power that state and capitalist institutions exercise through the human body to create subjects that are compliant to and efficient in carrying out its interests. • • Foucault claimed the homosexual was invented in 1870 • • . . .
• • His article will be continued on the next post. • • Chase Dimock, who teaches Literature and Composition at College of the Canyons, is Managing Editor of As It Ought to Be. • • Will Hays formally resigned as president of the MPPDA on Friday, 14 September 1945. 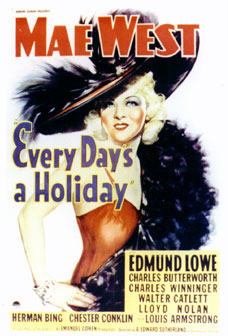 • • Mae West, in particular, found her pictures red-pencilled to bits and her witty lines either eliminated or denatured, thanks to the Hitler of Hollywood, motion picture censor Will Hays. • • Even as an officer of the law, Lloyd Nolan was unable to "go straight," and in "Every Day's a Holiday" he played the crooked police inspector who fought Mae West tooth and nail. • • Mae West said: "Look beautiful at the breakfast table." • • Syndicated columnist Dorothy Kilgallen mentioned Mae West. • • The Mae West Blog was started fourteen years ago in July 2004. You are reading the 4043rd blog post. Unlike many blogs, which draw upon reprinted content from a newspaper or a magazine and/ or summaries, links, or photos, the mainstay of this blog is its fresh material focused on the life and career of Mae West, herself an American original. Mae West: Crazy or Genius? Mae West: Ulrich or Urning?